ST. PETERSBURG, FLORIDA, April 27, 2018 – Clark Electric announced the “Plug Awards” at the Kick-Off meeting in January, 2018. 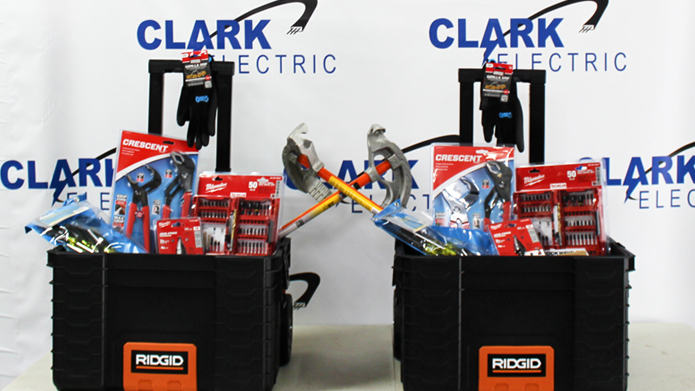 The Plug Award was created for the employees of Clark Electric to nominate each other for exemplifying our core values: Accountability, Trust, Safety, Quality, and Culture. Employees receive a small sticker with the core value on it to place on their hard hat. Each core value sticker that an employee receives to showcase on their hard hat represents that employee being “plugged in” to the values of Clark Electric. The first quarter nominations were sent in from company peers within the field and the office. Once every quarter the forms will be reviewed by the office staff and Plug Award stickers as well as certificates will be given out to each employee who was nominated for a Plug Award. There will be a drawing every quarter for a prize. To be entered into the drawing, you must have either nominated an employee for a Plug Award or have been a nominee for a Plug Award. To be eligible for the Employee of the Year Award, the employee must have received a nomination for each of the five core values as well as received the most nominations throughout the respective year. If there is more than one employee with a nomination for each of the five core values as well as the same number of nominations throughout the year, the Foreman will review each employee’s nominations and make the final decision. Clark Electric is one of the fastest growing electrical companies in Florida. Through our dedicated team of professionals, and partnering with the industry’s leading manufacturers, and distributors Clark Electric provides guidance from commencement of each project until the very last light is turned on. Each of our projects begin with our pre-construction department providing all necessary tools for estimating, budgeting, design-assist and planning of your project. Throughout each of our enterprises, our dedicated project management team is committed to assisting our clients and ensuring Clark Electric gives you the power to succeed. Founded in 2009, Clark Electric is a State Certified Electrical Contractor based in St. Petersburg, FL. We emphasize focus on three main operating departments: Commercial, Residential and Service. Our focus is on safety and providing continuous customer satisfaction.